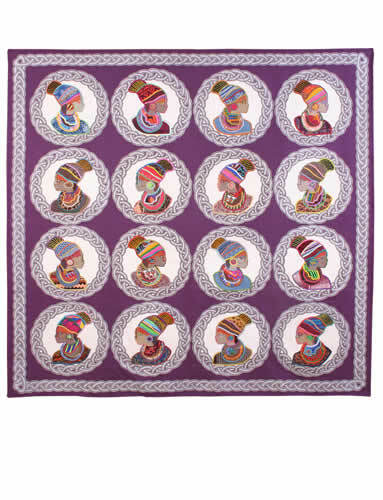 Sixteen beautiful African women in traditional wear framed in machine quilted rope circles. Each portrait was hand embroidered in the Sri Lankan style. The Purple backing is finely filled with an ethnic tri-angular quilted pattern and finished with a matching two colour rope border. It took 29 000 meters of thread and 230 hours of work on a sewing machine to complete the quilting portion of this project.